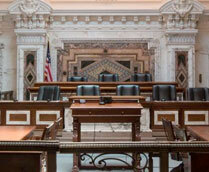 Calls to break up the U.S. Ninth Circuit Court of Appeals are floated on a regular basis. They surfaced again in late April after the U.S. Ninth Circuit Court of Appeals ruled against President Trump’s immigrant travel ban. Could such a breakup be done? Yes, but breaking up, even for a federal judicial circuit, can be hard to do. The Ninth Circuit, one of 13 federal circuits, stretches from Alaska down the West Coast to California and other states in the Southwest. Some have called for breaking up this judicial circuit because of the perception the court leans left in its rulings. Others have argued that the Ninth Circuit covers too large an area, and that judicial efficiency warrants a breakup. However, only Congress has the authority to break up a judicial circuit.